Last September, yep I’ve been lazy by a year to write this post, Mom and I traveled to Charleston, South Carolina. Ok not quite a year, because it was the end of September, but I’m cutting it close. I’ll make my excuse that I’m just now getting over how insanely hot and humid it was. While we really enjoyed the food and the sites, I’ll be the first to admit I was a big ol’ sour puss the entire trip because I was miserable from the weather. I felt like I was never dry, it was crazy humid. My cell phone died during the middle of the trip and didn’t start working again for a week after…because it was so. damn. humid. 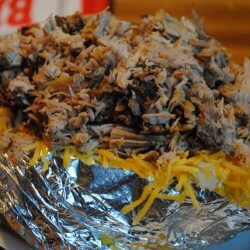 Good thing you can also get some really damn good food in Charleston, so I’ll get to that! We had dinner at Poogan’s Porch. It’s in this cute house and has such a cozy atmosphere. The portions are HUGE. I wish mom and I had shared a plate because neither of us could finish our meals, but we sure did try. Mom ordered the Cast Iron Pork Chop. 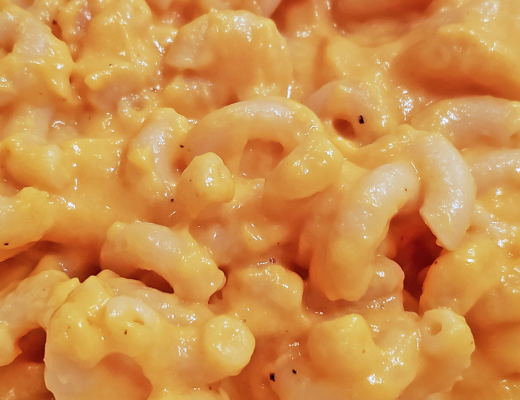 It comes with country ham gravy, green beans, and gouda mac andÂ cheese. I can’t believe I don’t have a pic for this one! I ordered the Plantation Fried Chicken. It’s stuffed with smoked gouda, spicy collards, and country ham, then served with whipped potatoes, green beans, and drizzled with a Texas PeteÂ jus. OMG is right! This was so good. Highly recommend this restaurant. 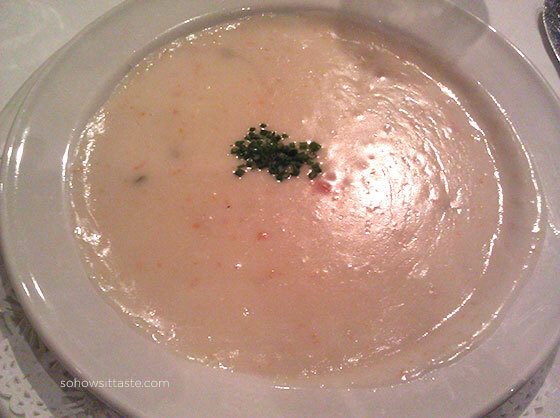 The next day we went to Hominy Grill. It was a bit of a wait because this place is pretty popular, but we both enjoyed it. I ordered the Shrimp & Grits. 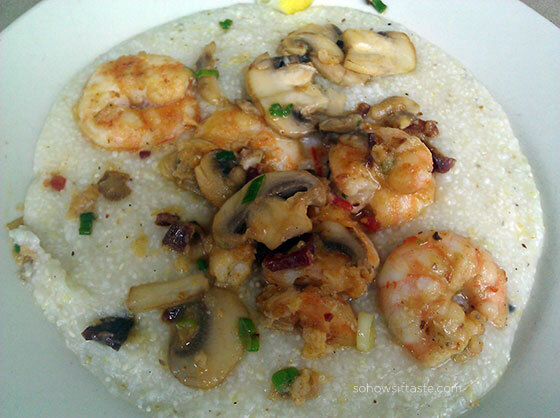 It’s sautÃ©ed shrimp with mushrooms, scallions, and bacon served over cheese grits. It was fantastic! I’ve ordered shrimp and grits so many times and been disappointed because it’s swimming in sauce. This one was just perfect. I loved the addition of mushrooms and of course the bacon! Mom ordered the Barbecued Chicken Sandwich with coleslaw on a kaiser roll. 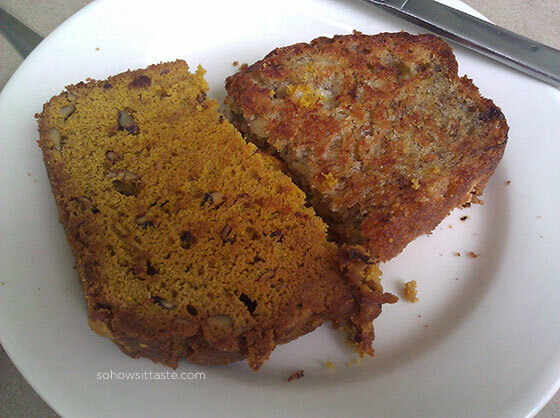 We couldn’t resist ordering a slice of their Pumpkin Ginger Bread and Banana Bread. This stuff was like crack. I loved how they toasted the slices…genius! For dinner we chose 82 Queen. I absolutely had to order their She Crab Soup. It’s award winning and I quickly found out why. 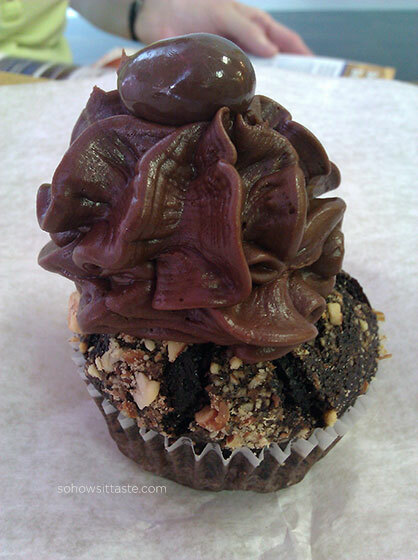 It was rich and decadent and sinful and I wanted to bury my face in it. 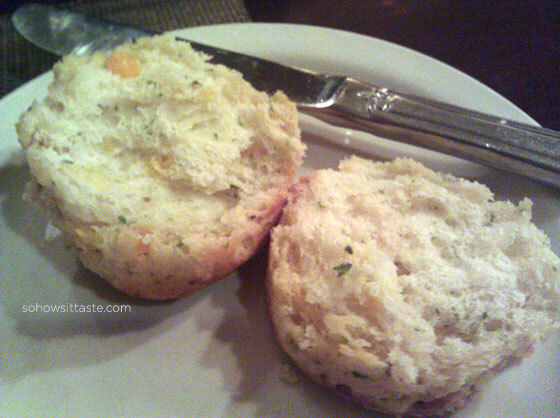 They serve these cute little Cheddar Chive Biscuits and they were so addictive! 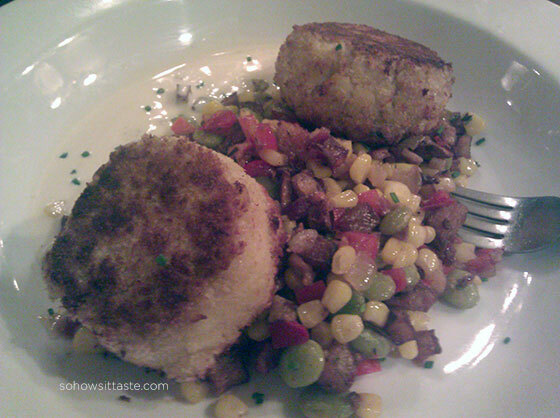 For my entree, I ordered the Lump Crab Cakes. It’s served with smoked prosciutto succotash and Tabasco beurre blanc. It looks like such a small amount of food, but I couldn’t finish it. I sure did try though. It was the most flavorful dinner. I wanted to keep shoveling it in so badly, but I was ready to pop! Mom ordered the Jerk Chicken Breast. 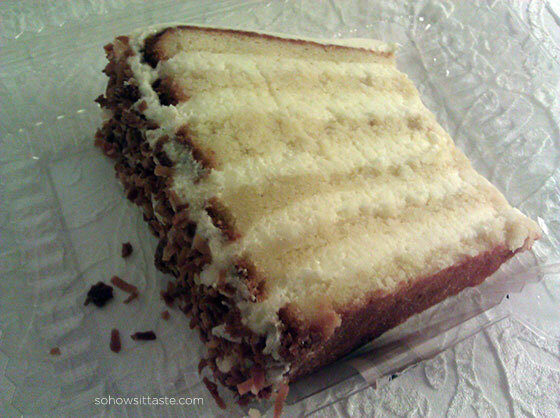 We had heard so much about the Ultimate Coconut Cake at Peninsula Grill, we had to have it. 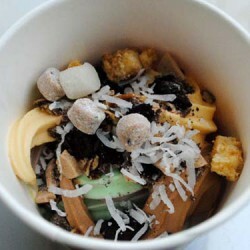 It was featured on Throwdown with Bobby Flay and it’s a bajillion layers of coconutty goodness. They give you a hefty slice, but we had no problem taking it down. I loved the cake and the filling between the layers. 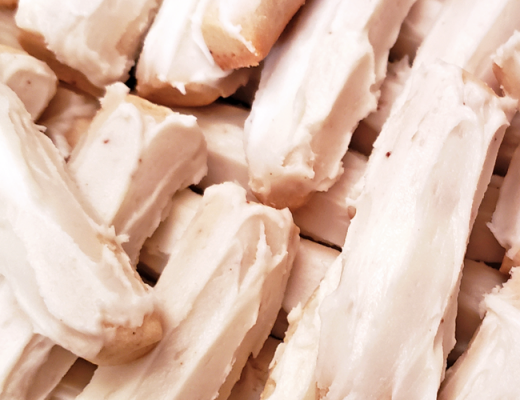 It was moist and had tons of coconut flavor. I didn’t like the icing on the top though. Way too much sour cream flavor and too tangy for my taste. 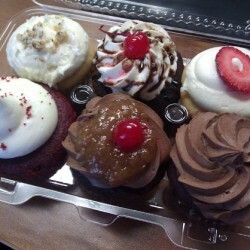 The next day for a sweet treat, we stopped into Cupcake. We split the Chocolate Almond. It was ok, but not anything special. 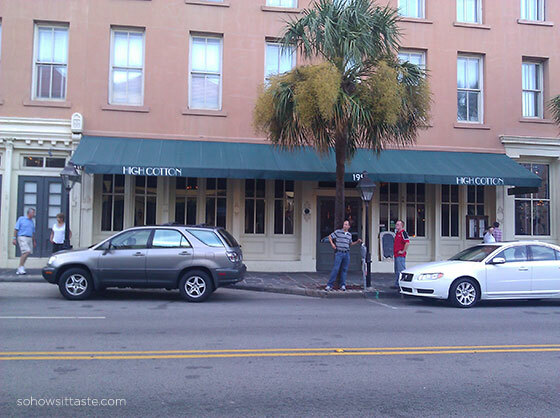 We popped into High Cotton for a fabulous happy hour. 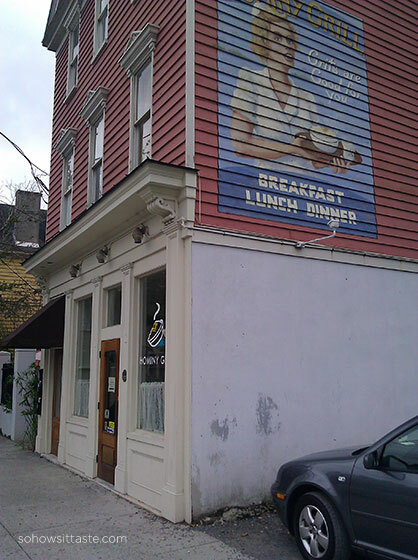 You may recognize this restaurant as it’s in The Notebook, where Noah sees Allie with Lon. Oh that movie is so good! Anyway, back to the cocktails and snacks. Mom had the Orchard Sangria and Southern Mule. 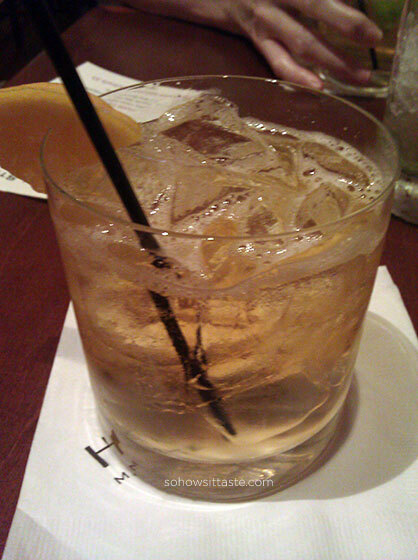 The Southern Mule was Maverick Vodka, lime juice, and spicy Blenheim ginger beer. I enjoyed the Smokey Rose and Margarita in the Raw. 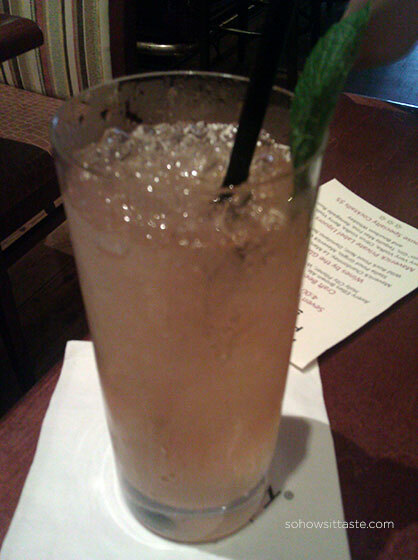 The Smokey Rose was Maverick Bourbon, Canton Ginger and smoked rosemary syrup. The Margarita in the Raw was Maverick Tequila Mas Fina, fresh lime juice, agave nectar and a splash of agua on the rocks with salt. 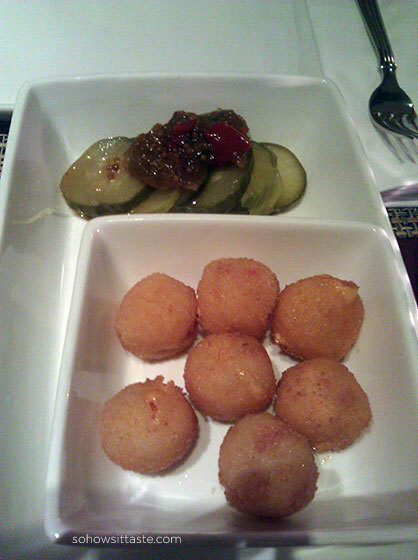 We also ate a little bar snack of Fried Pimiento Cheese with homemade spicy pickles. I could have eaten my weight in this dish! Awesome spot to have drinks and a snack before dinner. We loved it! 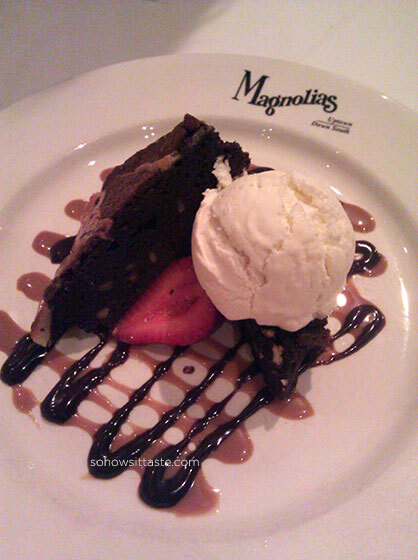 Our absolute favorite meal was at Magnolia’s. We loved every single morsel. 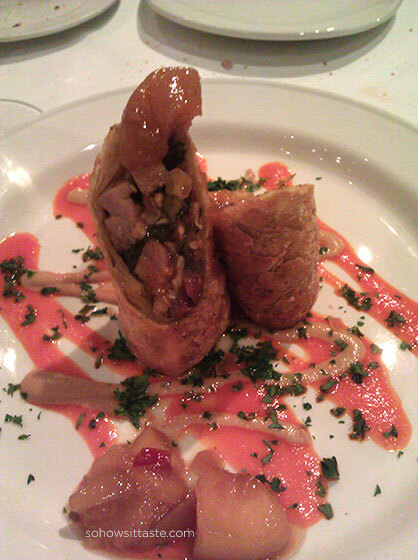 To start, we shared the Down South Egg Roll. It’s filled with collard greens, chicken, tasso ham, red pepper purÃ©e, spicy mustard, and peach chutney. It was so good. 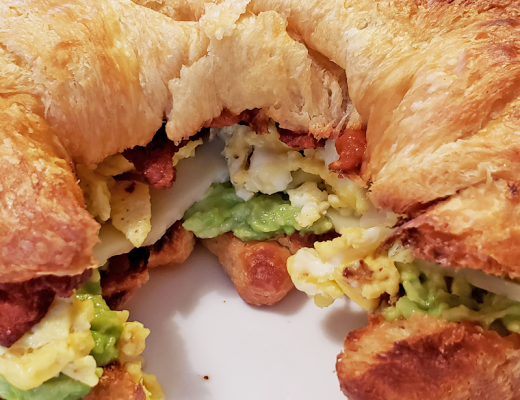 Savory with a hint of sweet all packaged up in a fried egg roll. 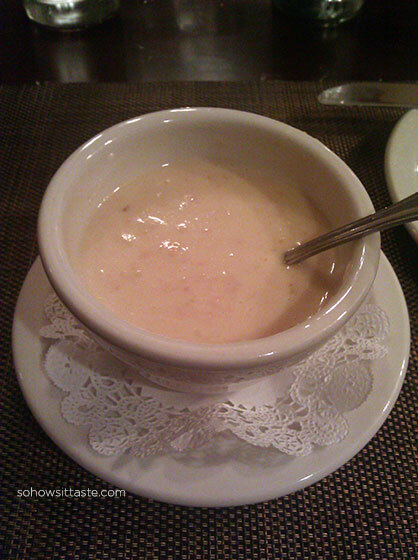 For my dinner I couldn’t resist ordering a bowl of Blue Crab Bisque. So rich and creamy, it was just what I wanted. 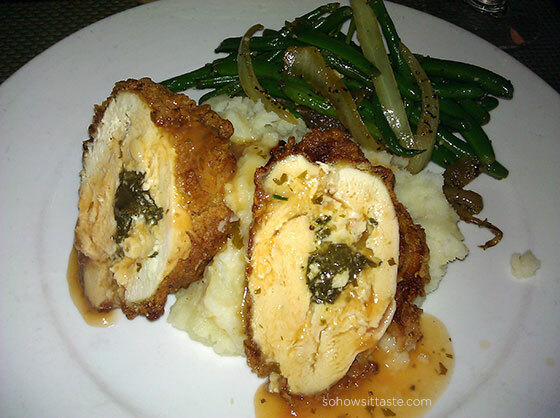 Mom ordered the Pecan Crusted Chicken with whipped potatoes, collard greens and peach jezebel sauce. This was her favorite meal of the trip! We had to order dessert, of course. 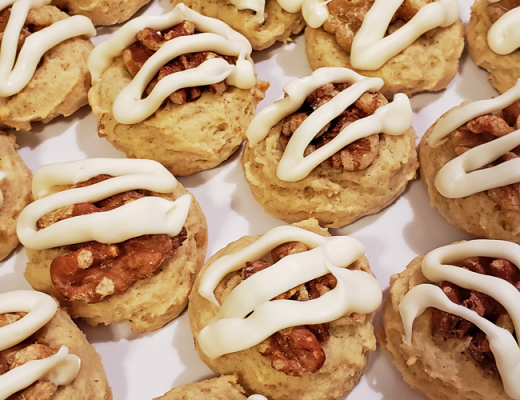 It was really hard to decide, but we finally chose Magnolia’s Warm Cream Cheese Pecan Brownie. It’s served with a scoop of white chocolate ice cream and caramel and fudge sauce. Oh my gosh, heaven! 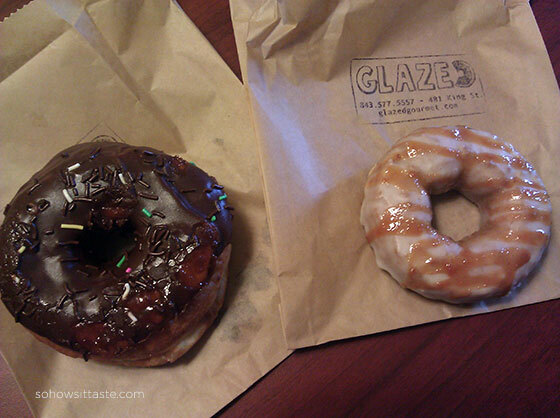 We made a pit stop into Glazed. I hear a lot of people raving about this doughnut shop, but we just found it so so. To be fair, we went in the afternoon when the selection was pretty picked over. We ordered a chocolate with sprinkles and a pumpkin. Not awful, but no where near the best doughnuts we’ve ever had. As you can read, we ate ourselves silly! The food was incredible and I’d love to go back…maybe when it’s cooler next time. We went along with our hosts’ recommendations when we were in Charleston, but I’m holding on to all of your recommendations for when we return. Because, God almighty, we will return for more of that delicious food! Looks like you really did have a food-filled vacation, despite the nasty weather. I’m like you – I think we’ll try and visit in November or December to hopefully not have to deal with all that humidity. I definitely want to go back. 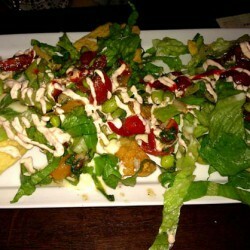 I feel like we barely scratched the surface of all the awesome food! Not going in summer though. I was miserable and whiney and that’s not a pleasant combo! 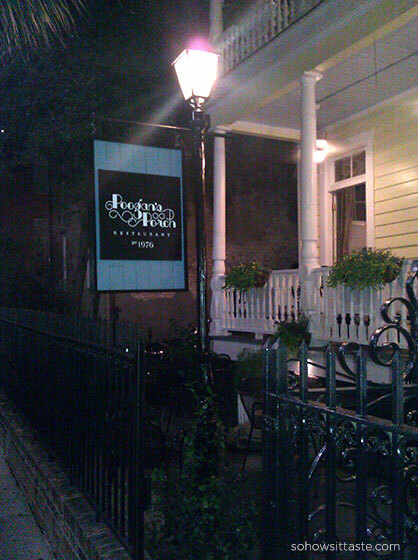 As if I didn’t already want to go to Charleston enough… now I NEED to go there! 🙂 Amazing eats! Thanks for sharing. So many good spots to eat and it’s gorgeous there, too. I’m ready for another trip back to Charleston! Rumor has it that Southern C Summit might be there next year…. Oh yes, darn it! We need to have a cocktail hour to chat about the stuff we missed today! My friend is looking at Charleston SC real estate homes because her company is relocating her to the area. 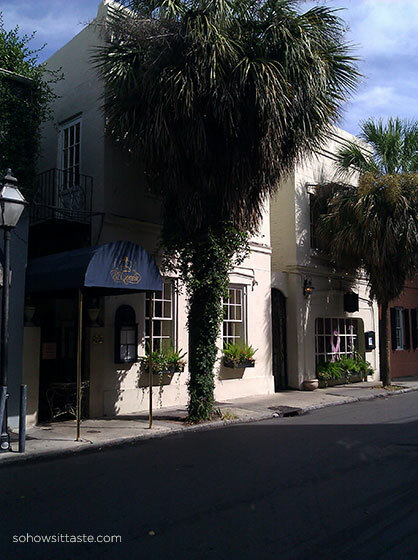 As I guided her in her house hunting trip, she couldn’t help but appreciate the designs and structures of several establishments in Charleston. I think she will love the area more if I invite her to try Charleston’s food. I’ll take note of the dining places you’ve mentioned. Thanks for sharing. After going through the pictures, simply a word came from my mouth: YUMMY. Really nice foods i must say. As i never been there, I was thinking that the realestate of Charleston SC are marvelous. But you changed my mind. 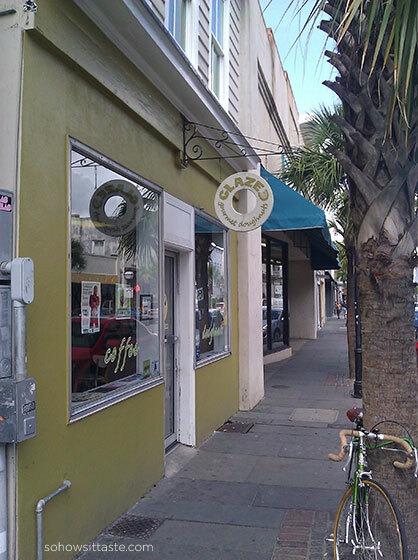 Now the same word will come from my mouth for Charleston SC’s foods also. Thanks for the post (specially for the pics).